A new study from eMarketer shows that legacy technology—the established platforms, databases, and devices used in organizations—is the chief obstacle to overcome as firm's seek to pursue their digital strategies. How can tech leaders overcome the human instinct to cling to one's established ways and the devices you are comfortable with? We all see them around and have them in our organizations. They are the ones who haul around their five-pound company-issued laptop. They are the ones still using a Blackberry—or worse, a flip phone! They are the ones who insist on doing the paper contract, rather than gathering all the digital signatures. They are the ones who insist on flying everyone into Cleveland for a meeting in the middle of winter, rather than conducting a video conference to accomplish the same task. They are largely—but not exclusively—the gray-haired folks. They are the ones who cling to the old ways and the old technology they know, rather than switching to the new ways of doing things. They are the ones that will use their outdated devices, no matter if the support has long run out on them. In fact, they will not surrender them until someone—or more likely a group—comes down from the IT department to pry their old dumb phone, their old hulking PC, their old heavy laptop—as Charlton Heston famously put it about another device—"from their cold dead hands!" And so I recently read with interest a new article from Ross Benes, an analyst with eMarketer, entitled "Legacy Tech Delays Digital Transformation." In the article, Benes looks at a number of recent studies that seem to all confirm the same general notion that those of us dealing with change—particularly change when it comes to all matters technological in organizations today—have to confront all too often. That is the fact that there are very real modern day Luddites—and indeed often entire communities of Luddites out there in even the best of companies, organizations and government agencies. They are the folks who are resistant to change and prefer to continue to do things as they have been done, no matter how much the new technology benefits them and no matter how—and how well—the new ways are spelled-out to them. As can be seen in the results of Benes' analysis, there are a complex interaction of forces that hold back companies as they seek to pursue tech-based changes. Principal among these are an "over-reliance on legacy tech or lack of the right technology/tools" and "internal politics or cultural resistance." In short, as Benes put it bluntly: "One thing that makes it tough for companies to overcome legacy systems is that their workers can become used to relying on the technology they’re familiar with, even if it is outdated." Milton and his Red Stapler from "Office Space"
So, as a management consultant and professor, one of the most pressing issues as organizations of all sizes striving to transform—and maybe to transform again and again—to compete in the digital age is how to overcome the resistance and get "buy-in" from the "resistance" that almost inevitably is present in companies of all shapes, sizes, and industries when tech-based changes are undertaken. And so how do you overcome such "hardened resistance?" This is much harder in practice than many outside of the IT community can ever imagine. Things that make perfect sense to IT make absolutely no sense in the minds of some—perhaps many—in organizations. The fundamental aspect to all of this is that those involved with any attempt at IT-based changed have to quickly realize—and to greatly appreciate—that changes in tech are changes in people's lives. As such, we have an instinctive, visceral reaction when presented with change—and often, no matter how much sunshine, rainbows and nirvana are attached to a given change in the tech we use and how we use tech to get things done, there's going to be a very human reaction to all of this. To you, as an IT leader or as an organizational executive, the change that is being made may be a small change. It may be what you see as nothing. However, to some people, and to perhaps more than just some in your company, your agency, or your organization of any type, that change might be just as dramatic as the change in staplers was to Milton in that classic film—now almost two decades old—of how things really work in companies, "Office Space." 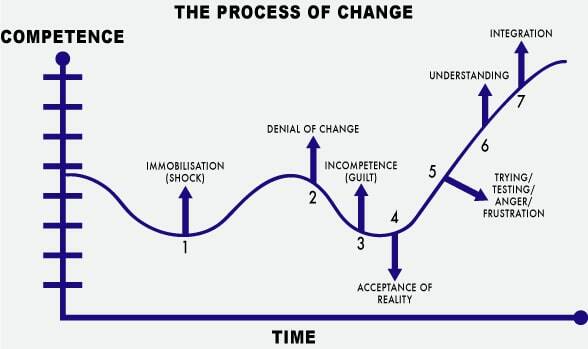 What's very interesting about all of this is to realize that the stages we go through in terms of making any kind of change in organizations—and tech today is perhaps the biggest cause of such changes—is the parallel between the process we go through in terms of adapting to change in our work lives paralleling that of how we adapt to changes—indeed the worst of changes—in our personal lives. In fact, the change process of how we adapt to changes in technology mirrors that of how we adapt to loss, following what is known as the Kübler-Ross Change Curve, which deals with grief. And so whether we are talking about switching from an old laptop or an old system to new, updated technology, such change means leaving something behind for something new. It means—literally—the death of an old way of doing things and the birth of a new, uncertain future. For some of us, we can simply switch devices with the ease of using our Visa card where American Express might not be accepted. Even if it represents a major change, we can simply make a technology change like a Civil War general who mounts a new horse after his old horse was shot out from under him. To us, it is simply no big deal. However, to others, changes in what they use on a day-to-day (perhaps even hour-by-hour or minute-to-minute basis) and/or how they interact with the organization and others within it, changes that we may well perceive as trivial, can be perceived in our often idiosyncratic minds as life-altering. Ultimately, everything is about perception and changes in technology, processes, and interactions in our work life are indeed life changes. Thus, change is change. Never forget that. And never underestimate the degree to which we all perceive change differently. As such, if you really want to change the way things are done in an organization from a tech perspective—no matter how big or how small that change may seem to you, as a "techie" or as an "expert," the change to the folks getting the real work done on the front lines may be anything but small to them. And so no matter how much a change may benefit them, no matter how much it might make their work lives "simpler," and yes, no matter how much we may think that this change, this new device, this new system might be "the greatest thing since sliced bread," beauty—and functionality, and practicality, and usability—is all in the eyes of the beholder. And as such, you simply should never neglect that "last mile" of the implementation process. There is a sales aspect to implementing any tech change. And the bottom-line is simple: If you don't pay sufficient attention to those on the front-lines—and even those in the middle of the organization—who are needed to make the tech change become a successful digital strategy—you will pay—and pay significantly—down the road. History may not repeat itself exactly, but it does rhyme. And what it is telling you is to indeed "sweat the small stuff" in IT implementations and digital changes—as the effort put into it on the front end will be small compare to the reclamation and "re-education" work you may face trying to "fix" a change effort gone bad. Read next: The GN41 [email protected] Mini PC! What a Find!